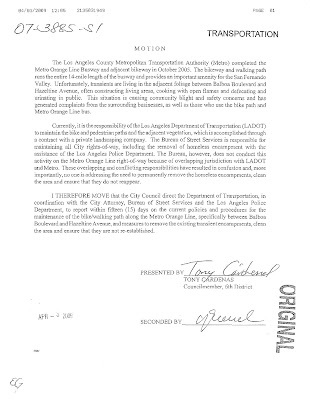 LA City Council's Transportation Committee meets today to review the Orange Line Bike Path, also known as the Orange Line Campgrounds. The Bike Path has long been a popular homeless encampment, especially in the Van Nuys area where the overgrown bushes, the liquor stores at each end and the recycling center all work together to create the perfect environment. Things came to a head a couple of months ago and everybody who had a piece of the jurisdictional Gordian Knot visited the Van Nuys Neighborhood Council to assure the community that they were "All over it!" It turns out that the LADOT had a contractor who was responsible for maintenance on the Bike Path but that the contractor had been remiss. The contractor got busy, put an edge line on some of the bushes leaving behind a well trimmed and trash free homeless encampment that was soon occupied by happy campers. 1) a car missed the turn (wb just west of Sepulveda) and drove onto the bike path, taking out the signs which are still on the ground. The shopping cart survived the incident. 2) the path has a dirt edge line that creeps well into the path indicating that it has not been cleaned in ages. 3) the large bushes that provide the homeless shelter have NEVER been cut back. The Orange Line Campground is occupied. The recent maintenance work resulted in a neatly trimmed Campground with an edge line along the bike path, completely missing the point. The bushes, the liquor stores and the recycling center make this a very popular Campground. 5) the broken sprinkler control with the open cage and leaking water doesn't speak well for any supervision. 6) the body on the bike path (passed out) and the difficulty in calling in the incident on the Orange Line Bike Path indicates a need to clarify AGAIN the jurisdictional issues for the Bike Path. LAPD dispatch can't take the call quickly without an address, dispatch wants to give the call to the Sheriff, the LAPD Sgt. that I flagged down said the LAPD doesn't have jurisdiction until 50' from the Orange Line. Capt Jordan of the LASD says that the Bike Path is City, the Busway is Metro. Oh my god, oh my god, oh my god - how can it be this easy to make these overpaid cityhall jackasses look stupid and ineffective? Another homerun on this piece. What is wrong with our city that we can't get things done? How much does this contractor get paid to (not) do this work?